VFD Driver IC (PT6315) - Princeton Technology Corp.
PT6315 is a Vacuum Fluorescent Display (VFD) Controller driven on a 1/4 to 1/12 duty factor. Sixteen segment output lines, 4 grid output lines, 8 segment/grid output drive lines, one display memory, control circuit, key scan circuit are all incorporated into a single chip to build a highly reliable peripheral device for a single chip micro computer. 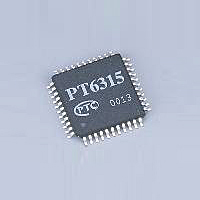 Serial data is fed to PT6315 via a three-line serial interface. It is housed in a 44-pin LQFP. Multiple Display Modes: (16 segments, 12 digits to 24 segments, 4 digits). Serial Interface for Clock, Data Input, Data Output, Strobe Pins. No External Resistors Needed for Driver Outputs.